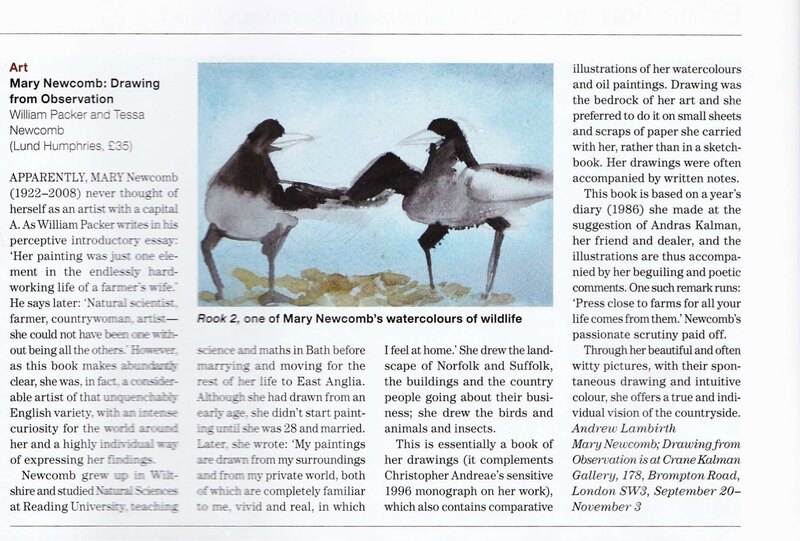 Apparently, Mary Newcomb (1922 - 2008) never thought of herself as an artist with a capital A. As William Packer writes in his perceptive introductory essay 'Her painting was just one element in the endlessly hardworking life of a farmer's wife.' He says later: 'Natural scientist, farmer, countrywoman, artist - she could not have been one without being all the others.' However, as this book makes abundantly clear, she was, in fact, a considerable artist of that unquenchably English variety, with an intense curiosity for the world around her and a highly individual way of expressing her findings. Newcomb grew up in Wiltshire and studied Natural Sciences at Reading University, teaching science and maths in Bath before marrying and moving for the rest of her life in East Anglia. Although she had drawn from an early age, she didn't start painting until she was 28 and married. Later, she wrote: 'My paintings are drawn from my surroundings and from my private world, both of which are completely familiar to me, vivid and real, in which i feel at home.' She drew the landscape of Norfolk and Suffolk, the buildings and the country people going about their business; she drew the birds and animals and insects. 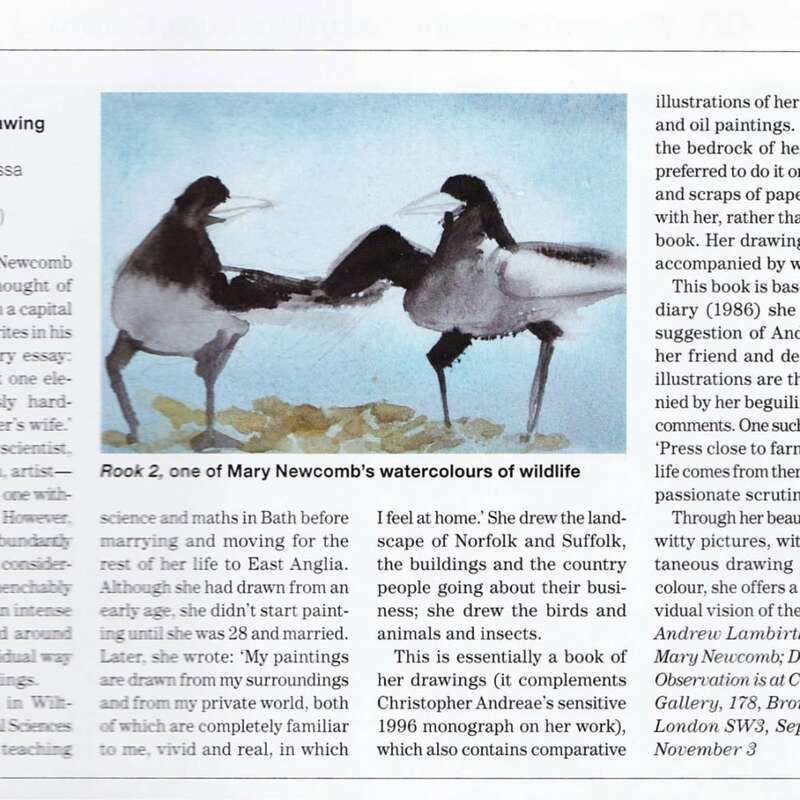 This is essentially a book of her drawings (it complements Christopher Andreae's sensitive 1996 monograph on her work), which also contains comparative illustrations of her watercolours and oil paintings. Drawing was the bedrock of her art and she preferred to do it on small sheets and scraps of paper she carried with her, rather than in a sketchbook. Her drawings were often accompanied by written notes. This book is based on a year's diary (1986) she made at the suggestion of Andras Kalman, her friend and dealer, and the illustrations are thus accompanied by her beguiling and poetic comments. One such remark runs: 'Press close to farms for all your like comes from them.' Newcomb's passionate scrutiny paid off. Through her beautiful and often witty pictures, with their spontaneous drawing and intuitive colour, she offers a true and individual vision of the countryside. Mary Newcomb, Drawing from Observation is at Crane Kalman Gallery, 178, Brompton Road, London, SW3, September 20 - November 3.